see how short i am.lol. SORRY ABOUT THE HAIR- it was soo windy and i took the picture at the end of a day spent running around. Nikki Minja shows us how not to wear animal print. I had a full day at uni and so needed to wear something comfortable. I am sure that you have all notice that normally i wear a bit of a healed ankle boot with all my outfit and seeing as how i am only 5''3 i need all the extra inches i can get. Today i could only wear flat shoes and i think i reached for this to try and add some colour into an otherwise dull outfit. 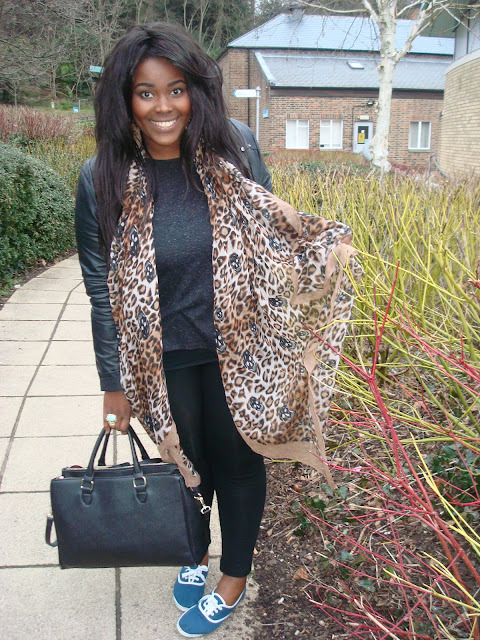 Its not really 'stylist'.. but then again when you are running from one lecture hall to anther up and down flights of stairs, i dot think you really care what is stylish or not.Some thing that i do think saves the outfit is the animal print scarf. I love animal print and sometimes wish i had more of it in my wardrobe.. but i do think with animal print there is a danger to look over the top and 'chavy' instead of stylish and effortless. The key to animal prints is to wear one thing and work your outfit around it. wear your animal prink jacket AND your animal print accessorises and you are half way to chav-ville.what do you guys think? yay or nay to animal print? I am sure that you have all noticed how my blog keeps on changing but i have been working really had to try and make my blog exactly how i want it and i think this is it now. I am loving the style and layout and i have to thank my brother in-law for his help cos he has been a BIG help. Sometimes, dear, it´s really necessary to wear flat shoes, but you look without high heels really stylish and beauty, too! aww that is the sweetest message i have read so far on my blog :). I am going to follow you now! I like your blog very much. You have a great style. I like Leo Print outfits. I love your bag its beautiful! I want the Prada back that look similar but my purse just cant stretch that far just yet so i will have to make do with this one. its soo useful for uni and everyday life for people like me who cary the whole world and its mother! Girl you look soooo gorgeous. Love the 'neutral' make up and of course te prints. 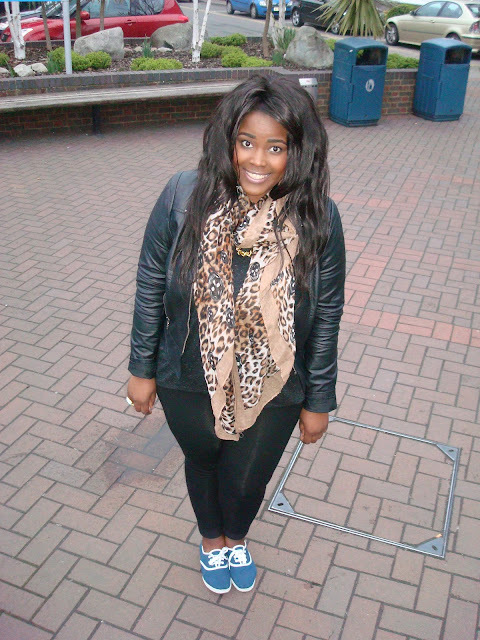 You are beautiful, love leopard print! ;) thanks gorgeous! Following you as well. I love that scarf and all of your leopard inspirations. I have just written to you on your blog. thank you so much for introducing it to me. i now have a new style icon. i love everything u have worn so far!! Cool outfits! Following you now on GFC.